Along with several other world-class tapestries, “Iris” is part of a scene from “The Jagaloon Tapestries”, which can be found in a castle near Krakow, Poland. They were originally commissioned by the King of Poland and were woven in Flanders in the mid 16th century. Pictured in “Iris” tapestry is a tranquil river scene. Out of crystal clear water in the foreground emerges river blossoms, which leads the eye to the forest beyond. 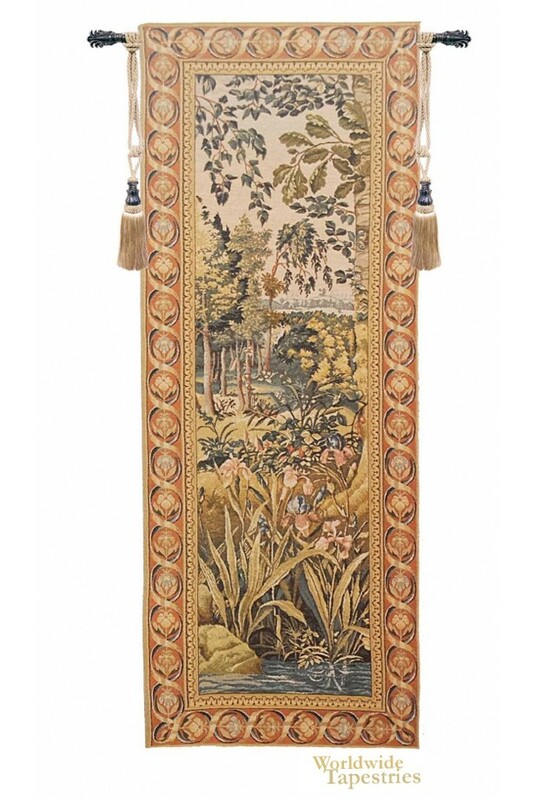 Framed by leaves from a tree, the tapestry is similar to the verdure style of tapestries, which also showed great depth and detail. Early verdures were used as door curtains, or portieres, which helped reduce the drafts castles were often famous for. This particular tapestry looks best when paired or combined with other pieces from the Jagaloon series, which includes “The Forest”, “Woody”, “Underwood”, “Wooden Hills” and “Woodland”. This Iris tapestry is lined and has a tunnel for easy hanging. Note: tapestry rod and tassels, where pictured, are purchased separately. Dimensions: W 26" x H 66"